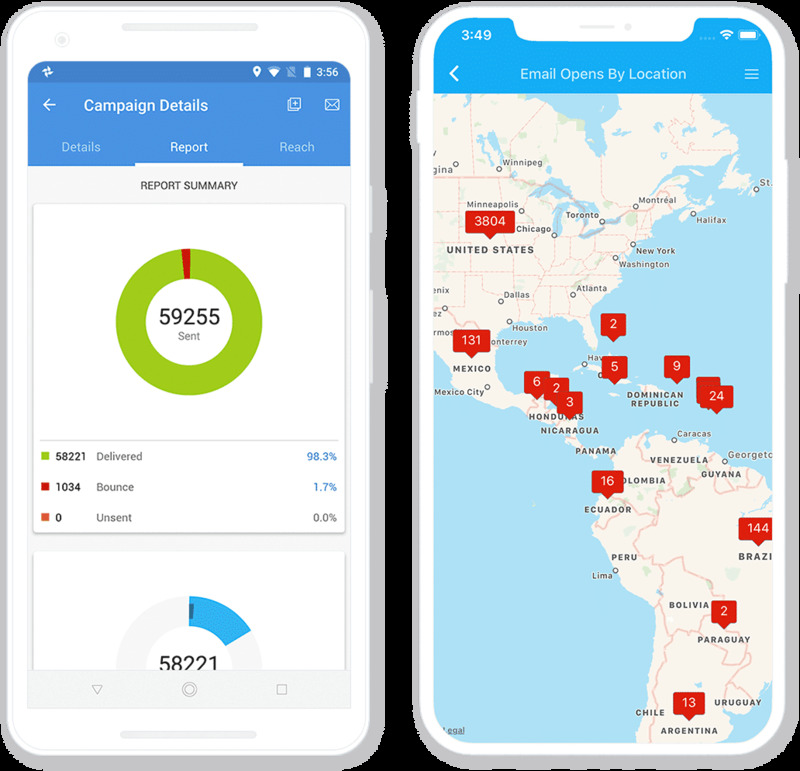 What is Zoho Campaigns ? 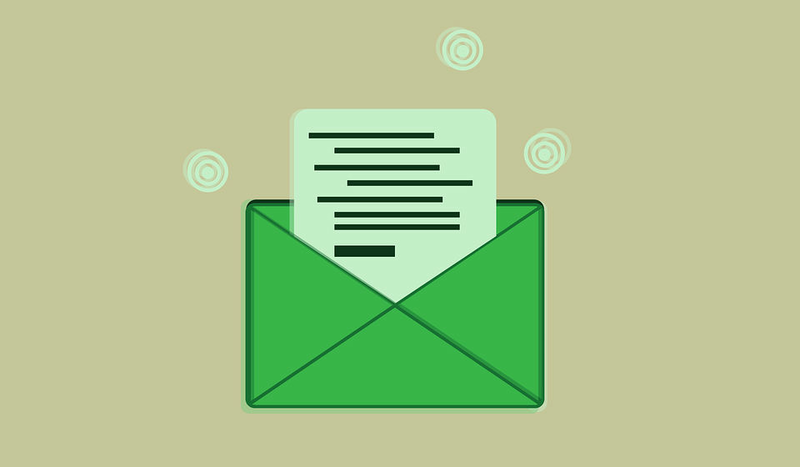 Zoho Campaigns helps you to send content-rich emails and makes your email marketing campaign more effective. 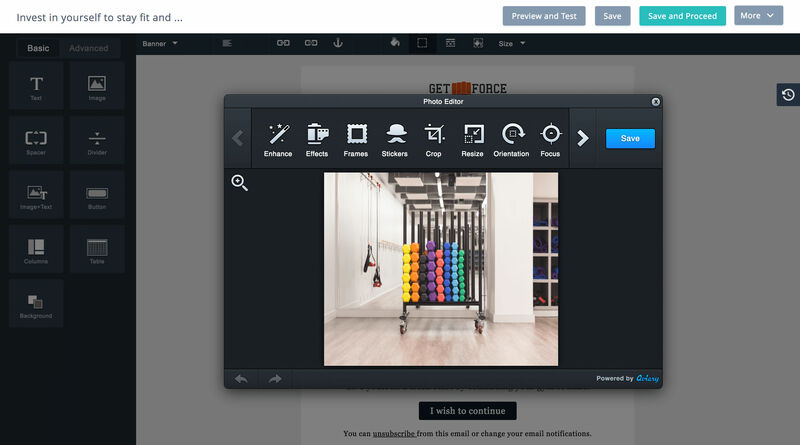 Its pre-designed templates and drag-and-drop editor lets you create and send attractive newsletters within minutes. 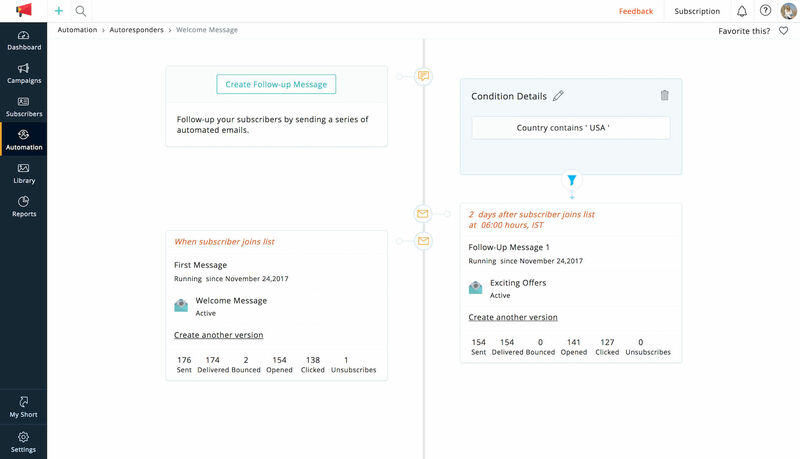 Its marketing automation tools let you send follow-up emails easily and keep your audience engaged. 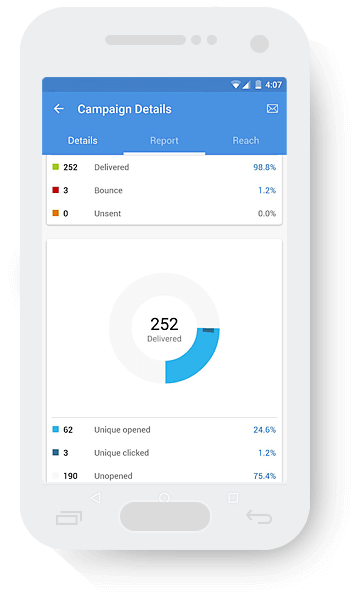 With Zoho Campaigns, get insightful and detailed reports about your campaign performance that will help you take informed decisions. 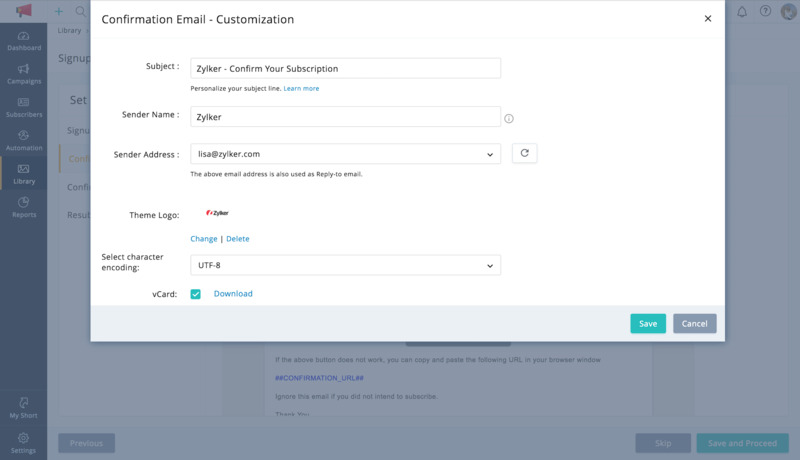 It also helps you make your email look more personalized and dynamic, so that every subscriber feels the message is only for them. 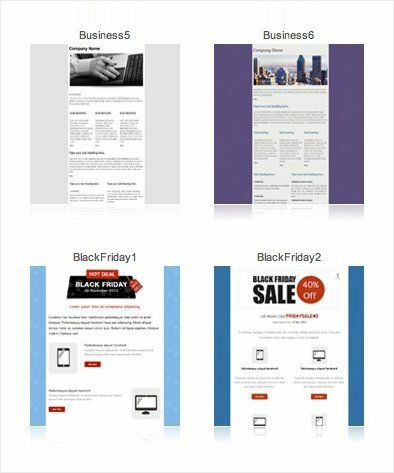 It also conducts A/B Testing between two versions of your campaign to find out which one is more effective. 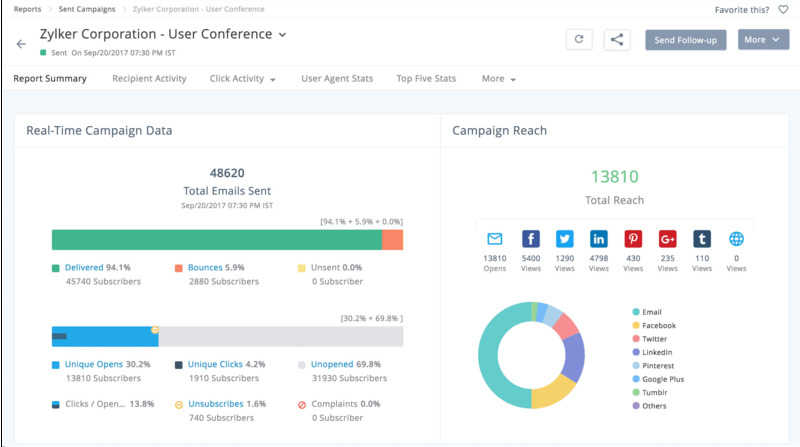 How much does Zoho Campaigns cost ? The pricing for Zoho Campaigns starts at $12.0 per month. 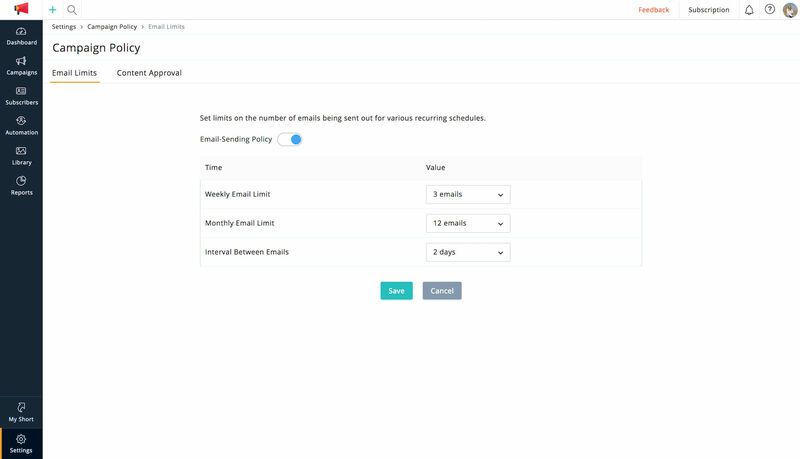 Zoho Campaigns has 2 different plans such as - Subscription at $12.0 per month and Pay-as-you-go at $40.0. Zoho Campaigns offers a Free Plan with limited features. They also offer an Enterprise Plan for their product. 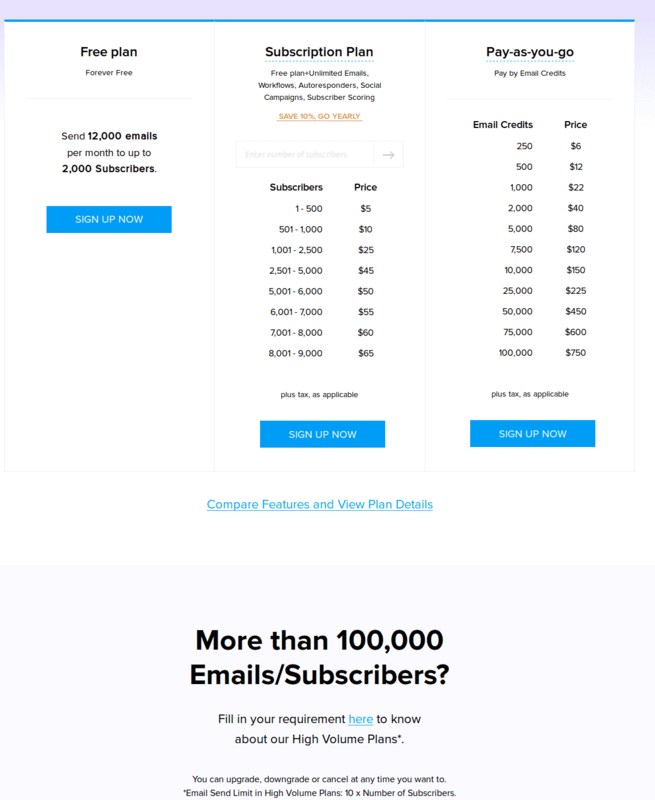 Send 12,000 emails per month to up to 2,000 Subscribers. Fill in your requirement here to know about our High Volume Plans. 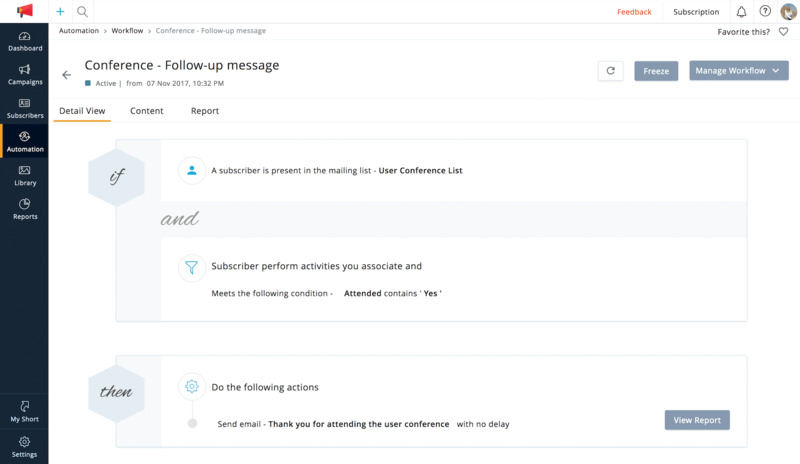 "Simple interface and best features"
We tried many other email marketing softwares / tools before, but we liked Zoho because of its easy to use interface and no compromise on complex features like workflows. 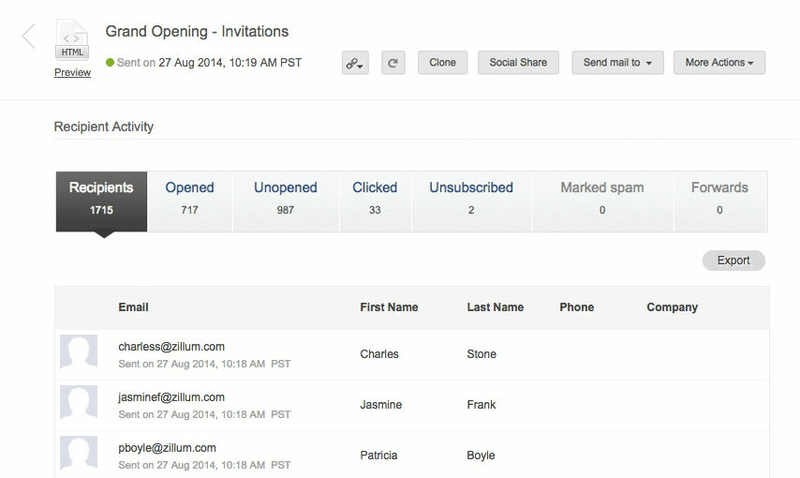 We tried many other email marketing softwares / tools before, and we don't like anything in Zoho apart from it's UI. 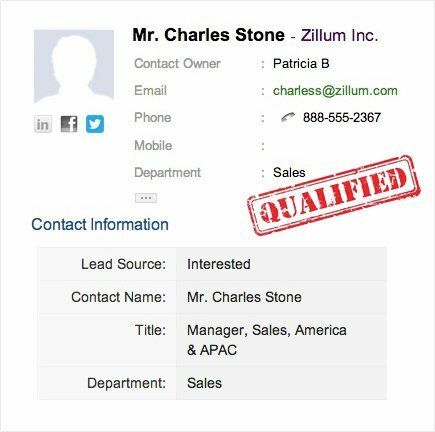 We're now able to smoothly connect with our prospects and clients. It has very friendly user interface. Using is easy and results are stunning. Keeping in touch with customers. Providing new products. It's pretty easy to set up. Very smooth and flexible. The 24 hour support, they are very fast. A bit of trouble with RSS in the beginning but was sorted out quite fast. 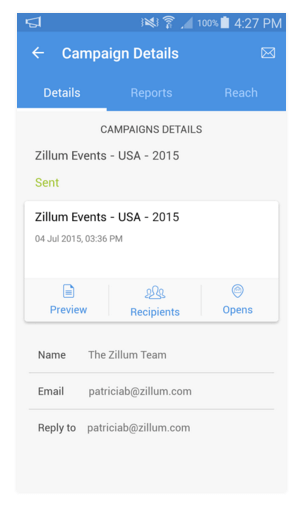 "Easy to use Zoho Campaigns"
Zoho allows us to manage our campaigns easily. 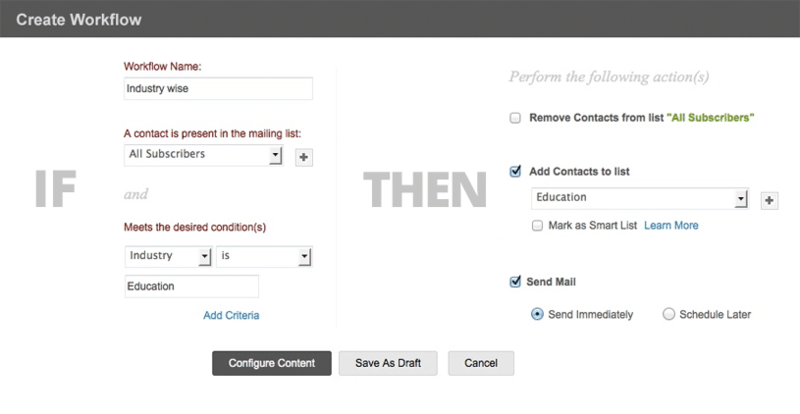 Making lead forms and it also have robust marketing tools. It integrates with may software. Pricing is cheap and gives 2k subscribers for free every month. 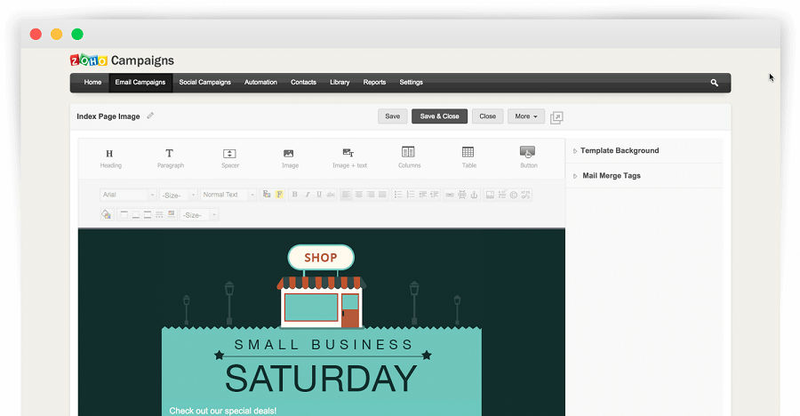 In zoho campaigns the least I like about is the email templates and the flow of designing the templates. It is the most efficient, simple and effective tool in market that helps us manage our campaigns. It provides metadata which is one of its unique features. They provide customer service round the clock. It has allowed us to create some exciting campaigns and marketing tools to get visibility to our customer base. Overall it has increased our income by a lot in the last year since we start to use the Campaigns feature. 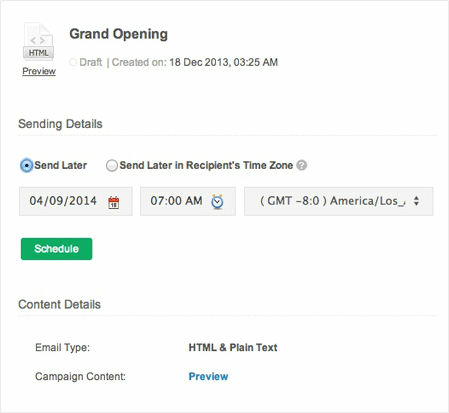 Email campaigns have never been easier, thanks Zoho! I have nothing to bad to say. This software works as it should. An award given to products that are appreciated by our users.